Newton Aycliffe family-run firm Stiller Warehousing and Distribution is investing £2m in a new distribution centre which could eventually create up to 25 new jobs. The palletised distribution centre will be the largest of its type in the North East and will allow Stiller to load 30 vehicles at any one time. Stiller’s existing distribution operation is run from one of the firm’s older warehouses. The new development will enable Stiller to create more warehousing space within its current distribution centre as well as upgrading it. Managing director Matthew Stiller explained: “Moving the distribution side of the business to its new home is primarily to enable us better cope with the rate of growth we’re currently experiencing. “It will also mean we’ll no longer have trucks running through one of our larger warehouses, but it will also give us the opportunity to develop what is now being used as a distribution centre into extra warehousing space, while upgrading it to a higher standard. Stiller’s new distribution centre will take up five acres of the firm’s 22-acre site at Ridgeway on Aycliffe Business Park, and its construction is also supporting local jobs. As well as main contractor Wharton Construction, which was recently handed the best large company award from Northern Counties Safety Group for health and safety, Darlington-based ADG Architects, Durham civil engineers BDN and PTS Demolition of Shildon are all involved in the project, as well as Aycliffe-based John Wade Group and SCH Site Services. 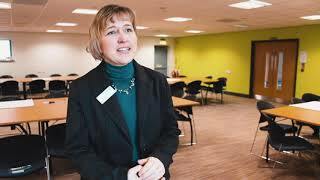 Matthew said: “There are several other sub-contractors based on Aycliffe Business Park we’re extremely pleased to be working with on the project. “It has seriously been very much our ambition to support local jobs, so we’re always steered towards using local companies. Stiller’s turnover by the end of 2017 is expected to hit £14.4m, up £2.5m from £11.9m in 2016, which is made up of £10.2m from distribution and £4.2m warehousing, while its workforce has grown to 164 this year. Matthew added: “Our growth this year has been down to winning new contracts in both sides of the business and a general uplift in our pallet network system, Palletline, a national co-operative which is experiencing growth. 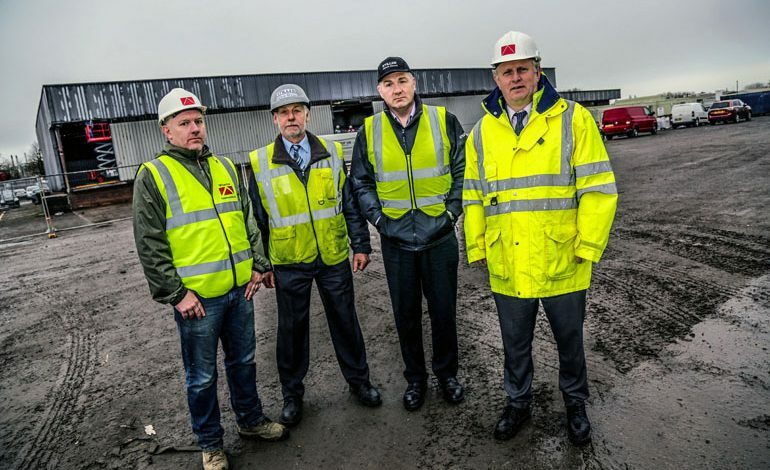 • Pictured above: Wharton Construction site manager Andrew Honeyman (left) and estimator Stewart Crinson (right) with Stiller Warehousing and Distribution fleet and facilities manager Herbie Blaser (second left) and pallet distribution manager Michael Garnett, on the site of Stiller’s new £2m distribution centre.